Interior Mats for 2017+ F57 MINI Cooper S Convertible Cabrio. 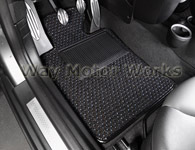 These mats include Floormats, boot mats, and mat accessories. Manufactured by Cocomats, Rennline, and OEM MINI.